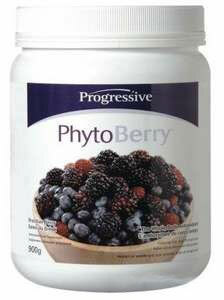 One of my most recommended supplements is PhytoBerry by Progressive Nutritional. Below is my PhytoBerry review which explain exactly what this supplement is and why it is so good for your health. PhytoBerry is a berry based whole food supplement that is loaded with natural antioxidants. Basically what they have done is taken fruit concentrates, phytonutrients, essential fatty acids, and herbal extracts and combined them into a powerful antioxidant supplement. One serving is equivalent to the nutrient content you would get from 6-8 servings of fresh fruit (without all the added sugar calories). Why are Antioxidants good for you? Basically antioxidants neutralize the effects of “free radicals” which are known to cause different kinds of diseases and illnesses. The free radicals are from the natural process of your oxidation of your body when you eat and your body combines the food with oxygen. The oxidation effect is what causes a car to rust or a fruit to brown. You can’t eliminate these free radicals but you can control and neutrilizae them by increasing the level of antioxidants in your body. Taken right from the PhytoBerry website some of the benefits of this product (and antioxidants in general) are boosting energy levels, supporting liver function, slows aging process, promotes mental clarity, supports cardiovascular health, balances blood sugar, improves digestion functions, and more. This supplement along with a multi-vitamin or Greens+ products are the first two supplements I would recommend to anyone looking to improve their health (lose weight, build muscle, etc). I was pleasantly surprised when I first tried PhytoBerry as it actually has a pretty good taste to it. It mixes well and tastes like a fruit juice. Overall I rate it a 9/10 for taste on its own. With that said I highly recommend you check out my Morning Energy Drink post where I talk about how I take my PhytoBerry. I started off by taking PhytoBerry mixed in with my VegeGreens (which tasted great) and then added in a scoop of Amino Energy to make it an amazing tasting energy boosting supplement great for the morning. What is the overall rating for this review of PhytoBerry? Overall I give this supplement a 10/10. It is almost a must have supplement for everyone. The positive benefits from antioxidants has been proven and they are definitely noticeable when taking this supplement. I was a person who suffered from a lot of colds in the past, but after starting to take this daily it is rare for me to get sick. I also notice a huge energy boost throughout the day, as I feel more alert and focused and just better overall. When you take this supplement you also can reduce the number of fruits you eat daily, which will help limit your sugar and calories (good for all fitness goals). I highly recommend this product to anyone who has a little bit of extra money to spend on their health (I would be purchasing this before almost any other supplement out there). I hope you enjoyed this review, and feel free to leave any questions below in the comment section. Visit www.BodyBuilding.com to purchase PhytoBerry at a cheaper price. Since taking this product, you’ve really felt a reduced incidence of colds? I, too, get the sniffles easily – as soon as someone near me is sick, I can be sure that I’ll catch it from them! I just don’t quite understand how antioxidants can be ‘captured’ and put into a powder form – don’t they ‘die,’ so to speak, or LOSE their antioxidant powers (or properties) once exposed to the air, i.e. once outside of the fruit? This is why I’m a little hesitant to believe that a powdered fruit product can actually offer you the benefits of antioxidants. Anyway, if you really do FEEL more energetic, alert, and healthier, then that may sway me in this direction! Thanks for your input :). Hey Dee, I don’t understand how all of it works – I just read up on the products and then try them out to see how it personally works for me. This product is now a daily staple in my life because of how great I feel in the mornings and throughout the day after drinking this. I’m considering using this alongside VegeGreens as supplements in my meal planning for the purposes of weight loss, overall health improvement, and getting into shape. I’ve heard that these two are most effective with proper timing of consumption. How do you get the most out of them? I recommend just taking them with breakfast. Hi, Kevin. I have always wanted to try this. Does the powder mix better with cold water or hot water? Thanks! I’ve been on veggie greens and phytoberry for about a year now, and I haven’t gotten sick once, while every single person around me was suffering all winter long, cold after cold! I don’t eat enough veggies at all , and I know that fruits have a lot of sugar in them, which isn’t great for weight loss.. I will always spemd the money on these, because I feel that its keeping me healthy. I also look much younger than I am ( by about 5 years). Hi Cory I have a question I recently started these two and I love it you say you have been taking it for a yr now . Do u take it consistently ? Or take breaks ? Also have u lost any weight since taking these ?